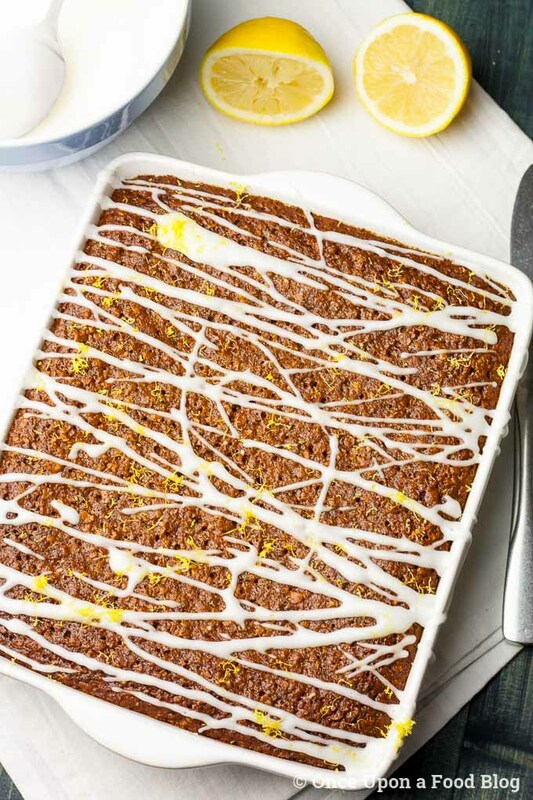 A gorgeous sticky ginger cake with tangy lemon icing. Perfect for when it’s blowing a gale outside! 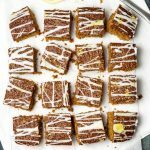 Ok, so I know that this is my second sweet recipe in a row, but I’ve been planning to post the recipe for this Sticky Ginger Cake with Lemon Drizzle Icing since last year and I can’t wait any longer! A year ago, this cake was on my list. But I got carried away posting so many other gorgeous autumn recipes such as my Old Fashioned Baked Rice Pudding and my Brandied Apple Custard, that before I knew it, Christmas was fast approaching, and I realised I had missed my moment. But hey, that’s ok, because that moment is here now! And boy was this ginger cake worth waiting for. If you’re like me and love the smell of sugary, buttery spices baking while it’s blowing a gale outside (as it is here, a very big gale!) then this cake is for you. However, not only do you get the smell of the gorgeous sugary, buttery spices filling your home, but added in is also the deep, rich smell of the treacle, which takes this cake to a whole new level! As I like to play about with recipes to get the perfect flavour combinations I tried making this cake with a combination of golden and maple syrup, but it was just not as good without the treacle. The treacle adds a warmth that the other syrups don’t. However, I am aware that these ingredients may not be easily available in other countries, so I also tried using a combination of maple syrup and molasses and that was just as good. So, if you can’t get hold of golden syrup and treacle then don’t worry, the American ingredients work just as well. And this cake is soooo easy to make. You simply heat the wet ingredients whilst weighing out the dry ingredients. Once the butter has melted, mix the wet ingredients into the dry then stir in the egg and milk and pour the batter into the oven dish. It couldn’t be simpler! 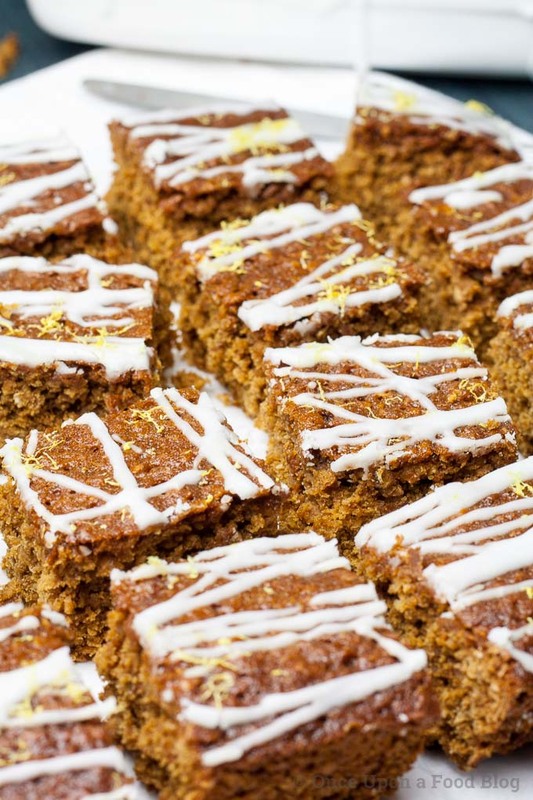 I’ve added stem ginger as an optional ingredient because I love it and I think it makes any ginger cake better, but feel free to leave it out if you want to. The cake doesn’t need it, so it is totally up to you as to whether you include it. I’ve also iced the cake as I think it makes it look prettier but again this is totally optional. This cake can definitely stand up on its own. Grease and line a 20 x 23cm (7½ x 8½ inch) dish. Place the wet ingredients into a small saucepan and heat gently until the butter has melted. Do not allow to simmer. Mix the wet ingredients into the dry ingredients then gently mix in the eggs and milk. Pour into the baking dish, place in the oven and bake for 1h or until the cake springs back when you press the top. Allow to cool in the dish. This cake gets moister and more gorgeous with time. If you can bare to, wrap it in foil and leave for up to a week before you eat it. 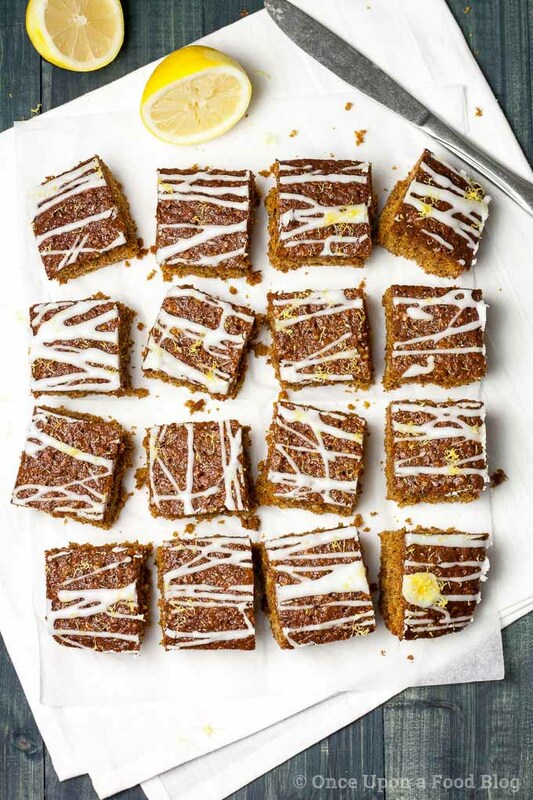 Before serving, mix the icing sugar with about ½ a tablespoon of lemon juice and drizzle over the cake. Sprinkle with some finely grated lemon zest. *If you are gluten free then make sure all these ingredients are gluten free and add in ½ teaspoon of xanthan gum with the flour. If you can’t find gluten free baking powder then replace with ⅔ of a teaspoon of cream of tartar and ⅓ of a teaspoon of bicarbonate of soda for each teaspoon of baking powder. 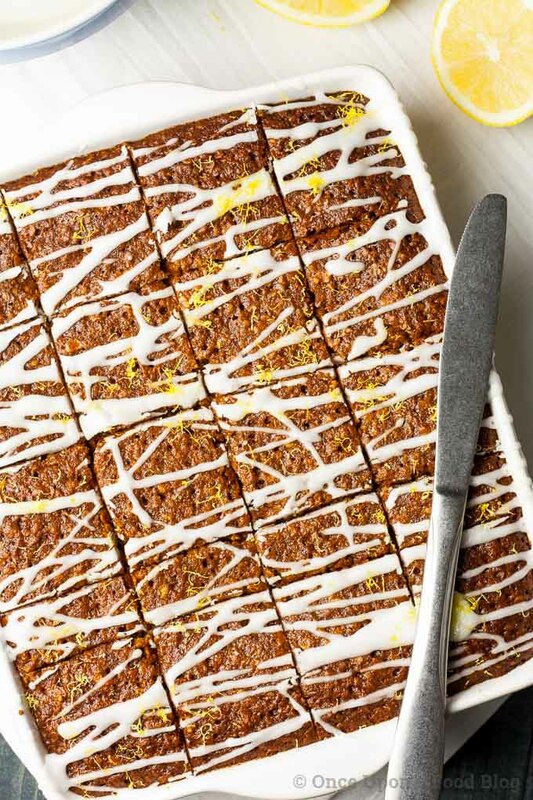 I love ginger cake but have not tried baking it at home as yet. 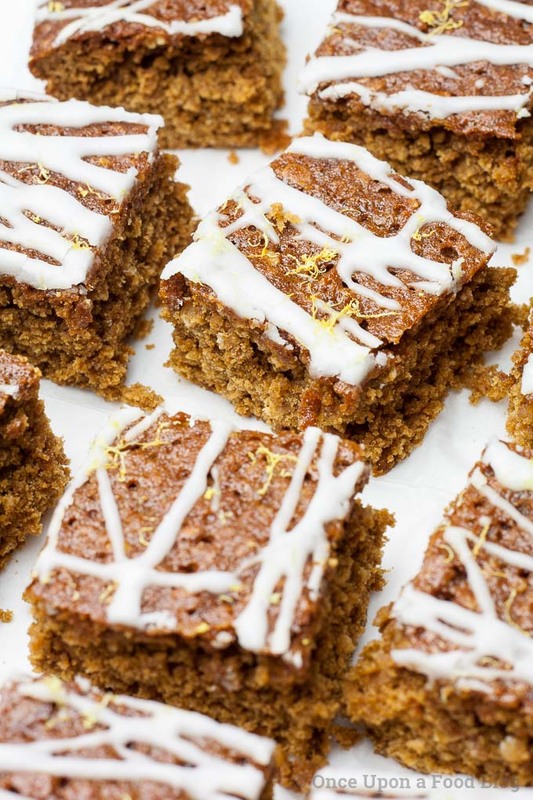 Love the combined flavor of ginger and lemon and I feel the icing on top makes the cake so attractive, tempting, irresistible……. I can go on and on. Pinning! This looks and sounds SO good. I love ginger, especially this time of year. Thank you for sharing, and for being a part of the Hearth and Soul Link Party. Hope to see you again this week. Have a great week ahead! If he’s a massive stem ginger fan then you could even make ginger icing and decorate with ginger, although the lemon icing is very yummy! You had me at “sticky” and “cake”. AND I just love ginger, so this is totally going on my to-make list. I’d love to eat this with my coffee in the morning! Thanks for linking up with #CookBlogShare! Ooh, I’ll join you for that morning coffee. Especially if you’re making!